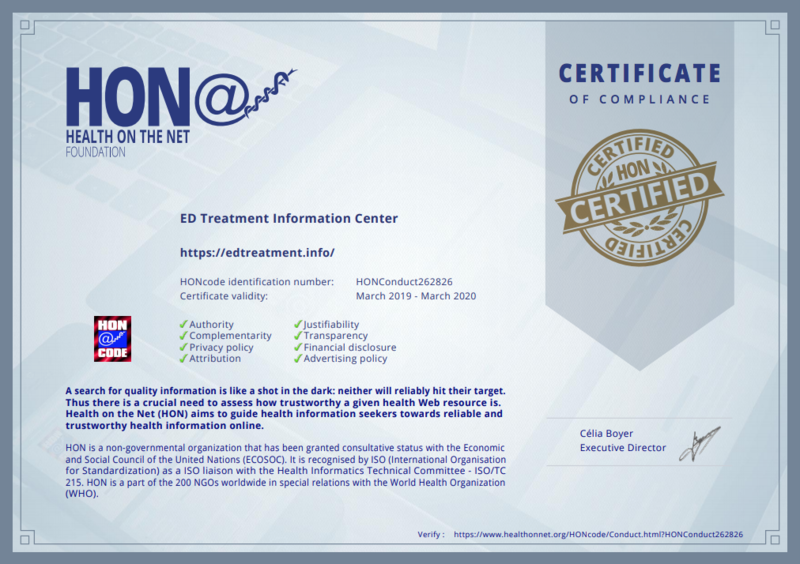 The ED Treatment Information Center is very proud to have been certified by the Health On the Net (HON) Foundation as complying with the HONcode… a code of ethics that guides site managers in setting up a minimum set of mechanisms to provide quality, objective and transparent medical information tailored to the needs of the audience. The EDtreatment.info website will be added to the HON directory, and indexed in its searchable web database. The Health On the Net Foundation is a non-profit organization, whose mission is to “to promote the effective and reliable use of the new technologies for telemedicine in healthcare around the world.” HON has been granted consultative status with the Economic and Social Council of the United Nations (ECOSOC). It is recognized by ISO (International Organization for Standardization) as an ISO liaison with the Health Informatics Technical Committee – ISO/TC 215. HON is a part of the 200 NGOs worldwide in special relations with the World Health Organization (WHO). The site posts authoritative information on the causes and treatment of erectile dysfunction. Wherever possible, articles on the site include references and citations to clinical research to support the information. Click here to verify our certification.